Displaying 1 - 60 of 103 items found. Worked in Tunisian crochet, this handsome vest is perfect for the office or for play! Size: Woman's small(medium)(large). This form-fitting summer top stitched in stretchy sock yarn features a pretty lace flower panel and is constructed by using individual body measurements rather than preset sizes. Talk about unique! 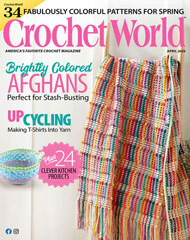 This free crochet pattern was originally published in the July 2010 issue of Crochet! magazine. Size: Make to fit. Made with super fine (sock) weight yarn and size 4 (2.00mm) steel hook. Want a flattering and free crochet pattern to stitch? You're looking at it! This pretty, lacy vest uses the love-knot stitch to create an interesting texture. Cinched at the waist, this crocheted vest is sure to look great on a wide-variety of figures. And, it's available as a plus-size pattern! This vest is made with lightweight yarn and a size H/8/5mm hook. Size: Woman's small [medium, large, X-large and 2X-large].